Making Paycheck Stubs are the most versatile accounting facilities you avail online. The self-help free paystub maker is all you need, whether you want to make a basic or advance pay stub online. If you are already habituated with online pay stub making then it is not a new thing for you. But, what if you are attempting any paycheck stub maker for the first time? You might get confused with, what should you choose. Here is all you need to know whether you should create a pay stub with simple generator or proceed with advance pay stub making. Before you proceed with any particular paycheck stubs maker, you should know the basic difference between the two. Simple pay stub generator is a tool which allows you to create pay stubs with the basic required details. You can also add fields manually, which is chargeable. This means that you can create a customized pay stub according to your need. You can even apply the pay stub template you want. 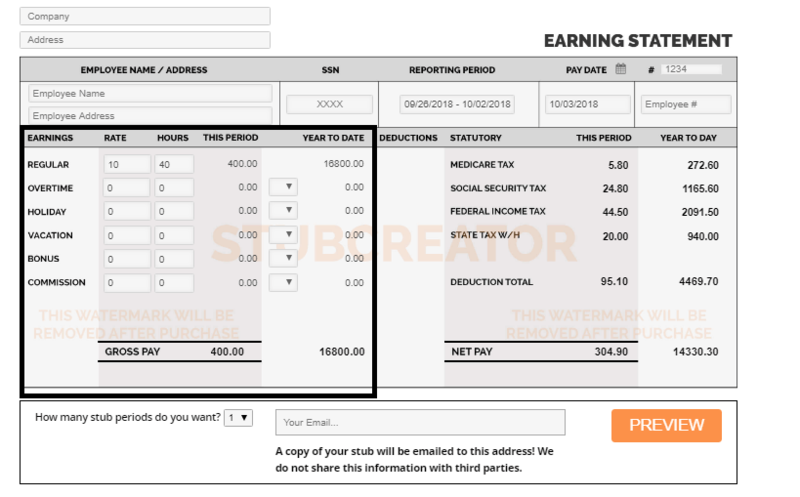 Related Read: Why should you use Paycheck Stub Template? 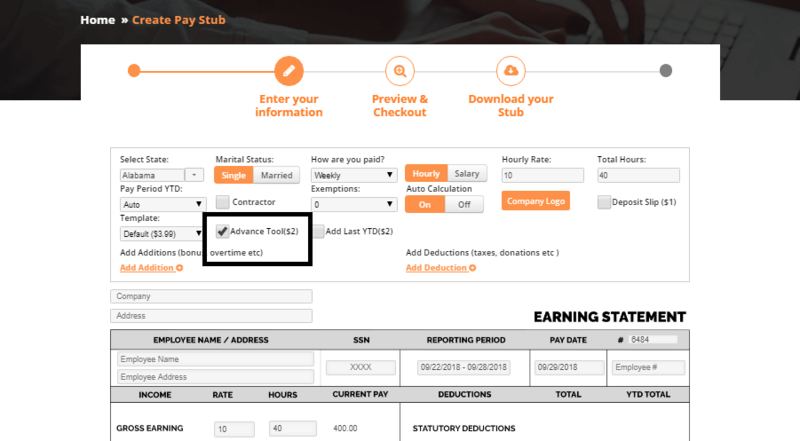 You can even switch the pay stub calculator from basic to advance by checking on the “Advanced Pay Stub” box and you’ll just have to pay $2 extra if you wish to access advanced features. The main thing with this paystub generator is that it is a legit tool if you have very few details and want to make a pay stub on the go. Once you enter the basic details and one amount i.e Gross Earning and you’re all set. As opposed to this, when you make paycheck stubs online using the advance tool, you are already having a mindset of reflecting pinpoint details on the pay stub. Here, you don’t just enter gross earning but enter every detail required. You have a sorted list of pay, amount i.e Regular pay, Overtime, Holiday, Vacation, Bonus and Commission which forms the gross pay. You may or may not fill certain sections, as applicable. However, the deductions will be automatically calculated by the tool. The accuracy and precision of check stub maker remain the same. Also, there is no change in three-step process to stub making. All you have to do is enter, preview and print. That’s all. Moreover, the difficulty level is zero. How will you choose the right pay stub generator? Well, it depends on your usage. As mentioned above, if you want to be more specific and provide classified amounts to your employees, go for advance stubs. 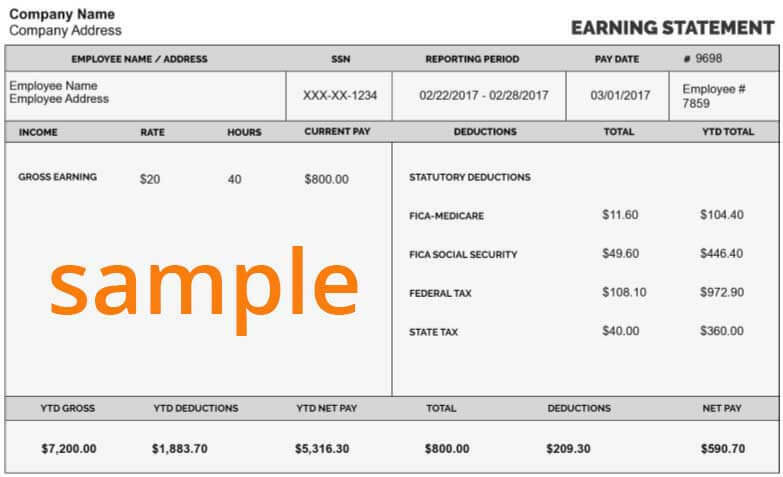 If you don’t want to go detail-specific then a simple pay stub maker is an all-time easy-going choice. It is to be noted that there are no specific or defined rules that you should use a particular paystub generator only. You are free to use any of the two, depending on your requirements. The main intention of creating stubs remains the same, so is the reliability of pay stub maker. Only the addition or deduction of details is witnessed. So, how are you going to make paycheck stubs today?